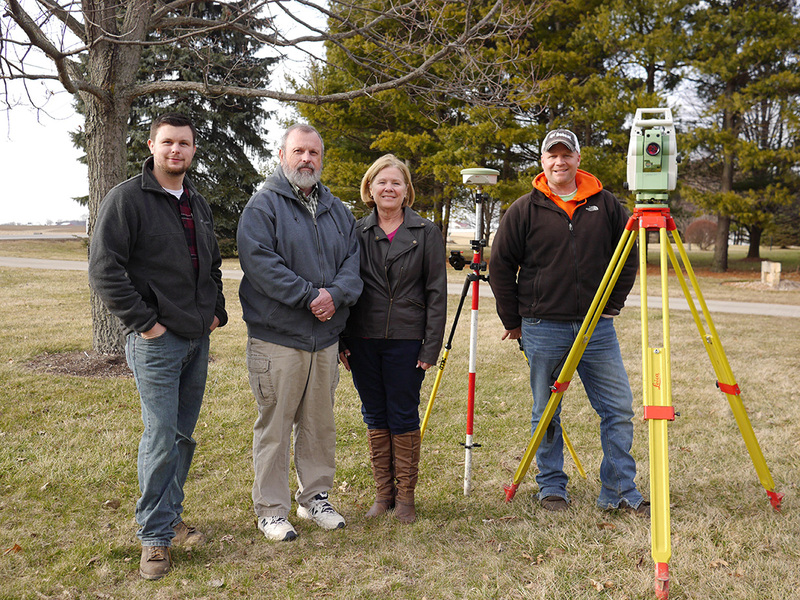 Cottrill Surveying, LLC is a small, family-owned surveying company located near Mt. Sterling, Ohio. The company was started in 1983 by current owner/operator James “Randy” Cottrill, PS. Our client lists include individuals, villages, cities, counties and the State of Ohio. For over 30 years, Cottrill Surveying has provided its clients with a quality product, in a timely manner for a competitive fee. We utilize up-to-date GPS, surveying equipment and software. We are licensed and insured to provide services throughout Ohio with the majority of our work concentrated in Fayette, Franklin, Madison, Pickaway, Ross and adjoining counties. please contact any of the county engineers for a reference. "click" button on left for detailed process. "click" button on right - fill out form - hit "Submit"
Randy has been self-employed since 1983 with a background in construction and civil engineering. After graduating high school, he joined the Navy Reserve and later completed his Associates in Civil Engineering at Shawnee State University in 1975. His construction experience includes working for: McNally Pittsburgh in Wellington, Ohio; Davis McKee Construction in Columbus, Ohio; and Kokosing Construction in Columbus, Ohio. He has also worked for Central Surveying of Reynoldsburg. After receiving his professional licensing in 1983, Randy began surveying evenings and weekends under the company name “James R. Cottrill, PS.” In 1985, he started Cottrill Surveying with his late wife, Connie, out of his home near Mount Sterling, Ohio. Since opening for business, Randy has trained two licensed surveyors who now both have their own practices. In his civic life, he is a member of Heber Masonic Lodge #501, Scottish Rite Mason, Aladdin Shrine, a member of the Mount Sterling United Methodist Church, as well as a member of the Fayette County Chamber of Commerce. In his personal life, he is married to Carol Cottrill and they have six children and five grandchildren. Nathan is Randy’s youngest child. At a young age, he began working with the field crews during his breaks in school. He received his Bachelors of Science in Civil Engineering at Ohio Northern University in 2008 and his Certificate of Land Surveying at Columbus State in 2012. After graduating ONU, he began his professional career at Burgess & Niple, Inc. in their facility inspection section. There he performed well over 1,000 bridge inspections in 15 states. Using adapted rock climbing techniques, Nathan completed over 50 fracture critical inspections on long-span signature bridges such as the New River Gorge Bridge in Fayetteville, WV, the Astoria-Megler Bridge in Astoria, OR and Dames Point Bridge in Jacksonville, FL. Nathan also obtained, organized and performed load rating data and analysis on various structures structure types. Nathan began shifting his focus back into survey. In his civil life, he is a member of Grove City Masonic Lodge #689, Scottish Rite Mason and the Aladdin Shrine (Brutal Brothers). In his personal life, he lives with his wife (Ciara) and son (Judah) in Grove City. Matt has been working for Cottrill Surveying since 1997. He is a 1996 graduate of Madison-Plains High School. He runs our field crew and has managed several other field crew members since 2002. He is fully trained using all our surveying equipment as well as manage several office tasks. Matt also assists and is fully trained using our surveying software. Matt has grown to be a loyal, hardworking employee over the years and is capable of answering most client's questions while in the field or the office. In his personal life, Matt enjoys spending time with his son and daughter and resides near Mount Sterling, Ohio. A Topographic Survey is of a parcel of land to locate the physical features on it, including natural features, such as trees and streams, and man-made features, such as buildings or roads. A topographic survey may also include vertical information with the relative heights of the ground and other identified features. A topographic survey by itself is not a boundary survey, but may be combined with a boundary survey to provide the location of property lines. A topographic survey is usually used for engineering studies or construction planning. A topographic survey is the most detailed survey. A Boundary Survey (new survey) is a survey to establish new boundaries of a new parcel(s) using the existing parcel's legal description, which typically involves the setting or restoration of monuments or markers at the corners or along the lines of the parcel, often in the form of iron pins, pipes, or concrete monuments in the ground, or nails set in concrete or asphalt. A map or plat is then drafted from the field data to provide a representation of the parcel surveyed. Included in this survey are a recordable plat and a legal description of the new parcel(s) created. A Boundary Survey (resurvey) is a survey to establish the boundaries of a parcel using its legal description which typically involves the restoration of monuments or markers at the corners or along the lines of the parcel, often in the form of iron pins, pipes, or concrete monuments in the ground, or nails set in concrete or asphalt. In the past, wooden posts, blazes in trees, piled stone corners or other types of monuments have also been used. A plat is then drafted from the field data to provide a representation of the parcel surveyed. Included in this survey are a recordable plat and a legal decription. Farm Surveys (new & resurvey) generally involve splitting off new or combining existing parcels of farm land; or existing the existing boundary lines for tax or zoning purposes when there is a dispute between recorded legal descriptions, plats and in the field boundaries. Often, the splitting of new parcels, depending on the county or township, requires creating a new subdivision. Once the field work is complete, a map or plat is then drafted from the field data to provide a representation of the parcel surveyed. Included in this survey are a new iron pins or markers, a recordable plat, and a legal description of all work done. A Town Lot Survey (resurvey) is a survey to establish the boundaries of an incorporated parcel using its legal description which typically involves the restoration of monuments at the corners or along the lines of the parcel, often in the form of iron rods, pipes, or concrete monuments in the ground, or nails set in concrete or asphalt. This survey requires two surveys in one; the first being to establish the location of the city or town block, and the second being to establish the location of the lot. Generally, it is more cost effective to survey more than one town lot at a time. A Right-of-Way Survey is a survey to locate and identify existing and new right-of-way easements, roadways and railroad tracks. This is not a new survey, merely a location of the existing or new right-of-way. A Construction Staking is done by construction layout technicians or professional surveyors when they are issued building plans. Use surveying instruments to establish stakes at a construction site that give locations and elevations of various parts of a construction project to guide the contractor in the building or vertical structure. A mortgage inspection is intended for use by a mortgage lender or title insurer to facilitate the sale or purchase of a property. It is not considered a boundary survey and no monuments (stakes or pins) are set by the surveyor. A Subdivision Planning is based on a survey of a parcel of land. Boundary lines are drawn inside the larger parcel to indicated the creation of new boundaries and roads . The number and location of the newly created parcels are discussed by the developer and surveyor until they are agreed upon. At this point monuments, usually in the form of pins, are driven into the ground to mark the lot corners and curve ends, and the plat is recorded. The recording of a subdivision plat is highly regulated. The final plat becomes a contract between the developer and the city or county, determining what can be built on the property and under what conditions. A Flood Zone Determination is similar to elevation certificates, but are used directly by insurance companies to determine if a parcel in located in a flood zone and defines all the aspects of that flood zone. This is not a new survey, merely a legal document stating the type of flood zone and any buildings that are located in the flood zone. An As-Built Survey isa survey conducted several times during a construction project to verify, for local and state boards (USA), that the work authorized was completed to the specifications set on the Plot Plan or Site Plan. This usually entails a complete survey of the site to confirm that the structures, utilities, and roadways proposed were built in the proper locations authorized in the Plot Plan or Site Plan. As-builts are usually done 2-3 times during the building of a house; once after the foundation has been poured; once after the walls are put up; and at the completion of construction. An Elevation Certificate is a certificate that verifies the elevation data of a structure on a given property relative to the ground level. The certificate is used by local communities and builders to ensure compliance with local floodplain management ordinances and is also used by insurance agents and companies in the rating of flood insurance policies. An ALTA survey is a surveying standard jointly proposed by the American Land Title Association and the American Congress on Surveying and Mapping that incorporates elements of the boundary survey, mortgage location inspections, and topographic survey. ALTA/ACSM survey, frequently shortened to ALTA survey, are often required for real estate transactions. Commercial Design & Layout is similar to construction staking, we work directly with the contractors to determine the location and elevation of all construction elements in accordance with the construction documents as provided by an architect, engineer, or builder. Extensive Research includes deed research, county survey requirements, property transferrals, etc. We have worked with all of counties in our service area to provide you with the best research network for all recorded property information. This service is included in all of survey types. Testify as an expert witness on property disputes including location of boundary lines, use of drainage easements, building/fence encroachments. Mission Statement . . .
"Providing our clients with a quality product . . .
in a timely manner . . .
Cottrill Surveying, LLC normally operates a one field crew; but has the capabilities to split into multiple crews when needed. We use a Leica Robotic Total Station T-16 and Leica GPS in the field, and Carlson Software with IntelliCAD. We continually update our software & instruments to meet the latest requirements of all the counties we serve. We do carry business insurance & errors and omissions insurance. OUR VALUED CLIENTS . . . Since 1983, we have served many repeat and new clients alike. We provide our clients with the best quality drawings, legal description and personal copies. We are dedicated to assisting our clients through the county approval process and have a good rapport with all the county engineers, tax map offices and recorder offices in our service area. If you would like to contact your county's office, we have provided you a list of all contact information on this page. Please feel free to contact any of these offices to hear about their experience with our work. FAQ: What is the difference between a Boundary Survey and a Mortgage Inspection? Answer: Mortgage inspections are often confused with a boundary surveys. A mortgage inspection (O.A.C. 4733-38) is intended for use by a mortgage lender or title insurer to facilitate the sale or purchase of a property. It is not considered a boundary survey (O.A.C. 4733-37) and no monuments (stakes or pins) are set by the surveyor. A mortgage inspection should NOT be used for establishing fences, building lines, ect. FAQ: Why do Boundary Survey cost as much as they do? Answer: Boundary surveys consists of three major components: research, field work and office work. Before the field work is started, each piece of land is researched at the county for previous deeds and surveys preformed in the area. These deeds are drawn in a CAD program and fit together as best as possible. Then we go into the field to locate known, undisturbed monumentation. This information is often brought back to the office and put together in accordance with surveying standards. Monumentation is verified and any missing markers are set during a follow-up site visit. A plat and legal are then written and submitted to the county if required. FAQ: Can you just find one pin/line? Answer: We have no way of locating a single line or pin without surveying a minimum of one parcel of land. FAQ: Can you just find my existing property pins without surveying my property? Answer: No. Once we locate all of your existing property corners, as a Professional Surveyor, we must prove they are in the original, undisturbed location. FAQ: Once I have a new boundary survey completed, what do I do next? Answer: We will prepare a plat and legal description for the property in accordance with the State Minimum Conveyance Standards. We have all of our plats and legals APPROVED by the County before releasing the paper work to the client. The client is responsible for having the deed prepared by an attorney or title agency and recording the new parcel. 8256 State Route 207 N.E. IT'S A GOOD TIME TO TALK!